People using Google's Waze navigation app on the iPhone can now pair it with any Ford vehicle running SYNC 3, giving them not just a mirrored touchscreen interface but access to voice controls. The feature takes advantage of SYNC AppLink, and requires only that people connect an iPhone with Waze and iOS 11.3 or later. While Waze continues to run on the iPhone, mic and touch controls transfer over to the car. Waze attempts to find the best route through traffic using crowdsourced data, including driver reports about police, accidents, and construction. 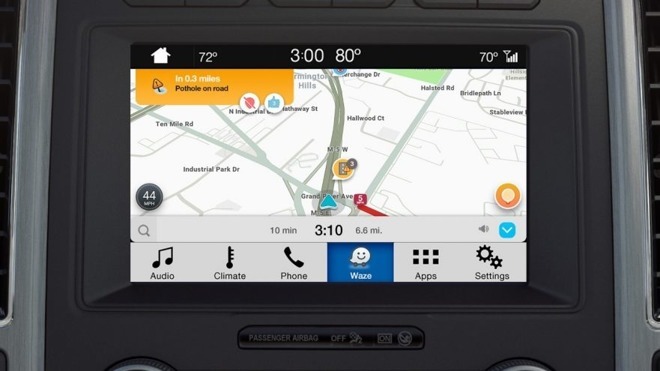 Ford offers a number of vehicles with Apple CarPlay, but CarPlay itself has been bereft of third-party navigation apps. That means that users are dependent on Apple Maps, even if they'd prefer something like Waze. Most recent Ford models should have access to SYNC 3. CarPlay first launched in 2014, but was initially slow to pick up automaker support. The technology is becoming increasingly commonplace and even expected, such that makers like Mazda and Toyota have had to concede to demand.